This book appears to be a retitled British edition of McKay's The Adventures of Mickey Mouse - Book 2, with new cover art. Actually, the cover of Dean's edition is a reworking of the back cover of McKay's edition, with Minnie redrawn as Mickey! I am not sure if the content of this book is from one of the American 'Big Little Books'. Next year, Dean would publish the British edition of the pop-up book Mickey Mouse in King Arthur's Court, with identical cover art as its American edition by Blue Ribbon from a year ago. 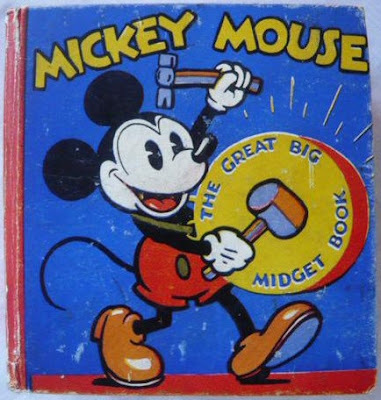 In 1934, the London & Glasgow-based Collins Clear Type Press would also begin publishing Mickey Mouse books and would really begin to dominate the British market of Disney publications throughout the rest of the decade, but Dean would also continue to publish Disney books. 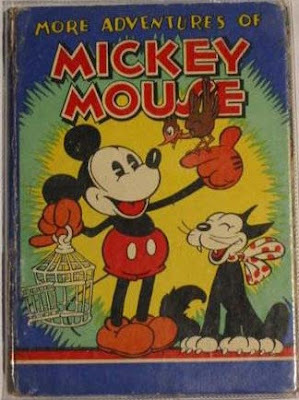 In 1935, they published British editions of McKay's Mickey Mouse Movie Stories Book 2 from the previous year, as well as Three Orphan Kittens, Tortoise and the Hare and Robber Kitten, illustrated story adaptations of Disney's 'Silly Symphony' cartoons published in the same year in the US by Whitman. These large and oblong-formatted books are among the best-looking pre-war Disney books with numerous beautiful full-page color illustrations. 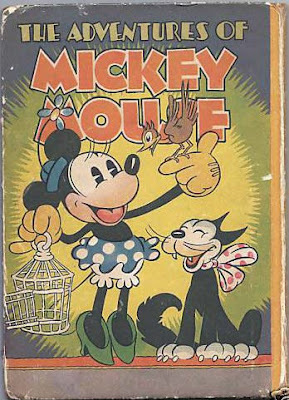 Apart from the Mickey Mouse Annuals which continued to be published well into the next decades, the last Disney books by Dean in the pre-war era appear to be a Snow White Annual from 1938 and Snow White and Magic Mirror from 1939, the latter with 3-D plates to be viewed with special spectacles. Collins' Disney books are too many to list here and would better be dealt in a separate blog, but three other British publishers needs to be mentioned in covering the pre-war era, John Lane the Botley Head, the Birn Brothers Ltd and the Juvenile Productions, all of which will also be covered in future blogs.